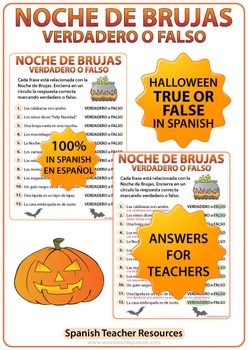 True or False Quiz about Halloween in Spanish. There are 12 statements about Halloween written in Spanish. Students must decide whether they are true or false. This quiz is completely in Spanish without any English on the worksheet. Includes an answer sheet that students can use to check their own work. Please download the preview so you can have a better idea of the quality of this resource and what it contains. This is resource is part of the Spanish Halloween Worksheets and Activities BUNDLE which includes many different activities. 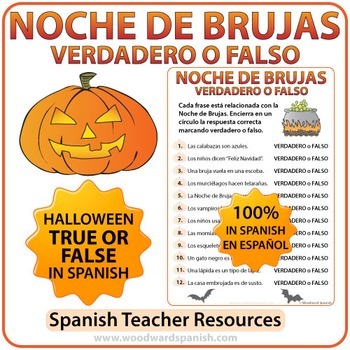 You might also be interested in our Halloween - Spanish Reading Passages and Worksheets at a Spanish 2 level. Click Follow Me to receive a message whenever we post any new items (and also whenever we have sales). - Angélica y Rob W.